Maple River Animal Clinic has the ability to perform farm calls and will do so throughout Emmet and parts of Charlevoix and Cheboygan counties. We encourage new livestock and horse owners who may be interested in utilizing our care to contact the clinic ahead of time to ensure they are located within our practice area. 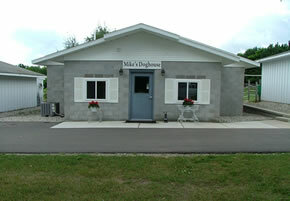 The clinic also features a free standing two stall barn with a stock and encourages haul-in appointments if possible. Additionally, some procedures may warrant hauling-in for the safety the stock provides. Further, the stalls allow for the hospitalization of large animals. Our veterinarians are comfortable treating horses, cattle, and small ruminants (sheep and goats). In addition to routine preventive care and herd management, Maple River Animal Clinic also has the ability to perform large animal reproductive ultrasounds at your farm. Further ultrasound capability for large animals (i.e., horse colic and respiratory disease) and digital radiography (x-ray) is available at the clinic on a haul-in basis. While minor surgical procedures can safely be performed in either the field or stock, Maple River Animal Clinic does not perform any sort of horse colic surgery.